As automation slowly takes hold in today’s businesses, organisations are realising the merits of reducing human errors through a more digitised workflow. Corporations are now splitting work processes between their employees and automation in order to improve the efficiency of their operations. Many critical business processes, such as data collection and entry between systems, can be digitised, as a result of which employees will be free from time-consuming, repetitive tasks and accuracy rates will improve. 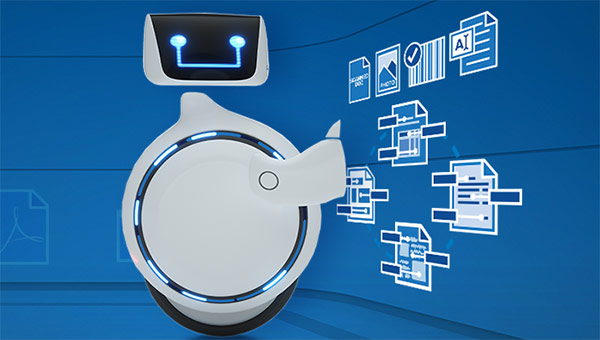 With Kofax Kapow™ robotic process automation (RPA), organisations can quickly and accurately receive, process, and transmit data from all kinds of applications or sources without the need for any programming to facilitate the processes. Xeratek Document Solutions can help your organisation support your employees with a digital workforce that cuts down manual workload and improves efficiency. With automation, your organisation also benefits from access to valuable information that was earlier difficult to obtain. By delegating manual tasks to software robots, Kofax Kapow™ allows employees to put their time and skills to better use at your organisation. Tasks that need to be performed by people will have the full attention and time of your employees and will thus be executed with greater efficiency. Kofax Kapow™ allows your organisation to shift from manual to automated data gathering and input processes, which eliminates the risk of error and increases overall accuracy. Any activity involving information processing can be automated. Kofax Kapow™ enables your organisation to slim down its data collection processes, which saves money and time as well as improves the accuracy and efficiency of the results. While other automation software may need additional programming to integrate with your organisation’s existing systems, Kofax Kapow™ will seamlessly fit in with your organisation without coding, making it more cost-effective to implement. Kofax Kapow™ comes with the flexibility to employ robotic process automation (RPA) as and when needed during a business process. A whole process can be automated or just the part where your organisation decides to eliminate manual work. The software can run to suit the structure and operations of your existing business management (BPM) and case management platforms. Ready to embrace the benefits of RPA in your organization? Let’s get started.